In the past I’ve talked about how TNA’s in ring action is usually a lot better than the booking of the product and the storylines. However, on this week’s edition of Impact I was impressed with the booking and format of the show with two strong storylines woven throughout leading to big reveals. Now it’s unusual for an X-Division match to make top billing on the reviews here, however with Destination X approaching and the possibility of the winner of this match getting a World Heavyweight Championship Match, the focus ,for now at least, is firmly on the X Division. 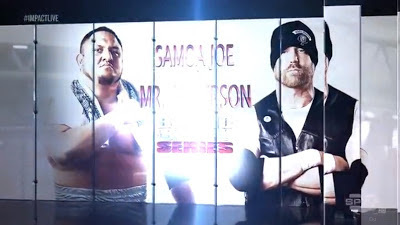 Before the match Bully Ray cornered X Division Champion Chris Sabin in what looked like the back of a truck, alongside Aces and Eights partners, Mr. Anderson and DOC. Bully did a good job of getting his point across that if Sabin should win, he shouldn’t drop the X Division title for a shot at Bully, whilst also putting Sabin over fairly well. This was the first time in a long time that Aces and Eights have looked strong in a segment, maybe because the numbers were kept to a minimum, giving each member more significance to the segment. 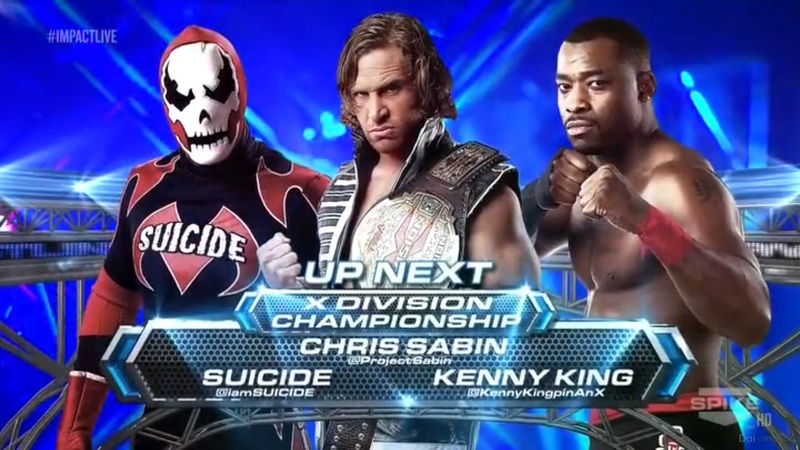 Personally, I preferred this three way match to the Ultimate X match the three had at Slammiversary, mainly because it allowed them to focus on the wrestling rather than worry about the Ultimate X gimmick, which didn’t really pay off in that match. It was well balanced and fast paced match, with enough technical wrestling to allow the high flying moves to stand out, as well as enough spots to keep the match having that X Division feel, including a nice drop kick from Sabin whilst King was in a tree of woe and Suicide was sitting in the same corner. The end saw King go for the Royal Flush on Suicide, with Sabin on the outside, only for Suicide to reverse into a sunset flip to get the victory whilst holding onto the ropes. My only gripe with the ending was how long Sabin spent on the outside after basically only being thrown out the ring by Suicide. Suicide holding onto the ropes teased a heel turn, but the best was still to come. After the match, General Manager Hulk Hogan turned up with former Ring of Honor Wrestling TJ Perkins. Hogan revealed as many already knew, that Perkins was the guy under Suicide’s mask, saying that the Suicide in the ring was an imposter. It didn’t quite fit the character of Suicide for Hogan to know who was under the mask “the whole time” but it made just enough sense to keep my attention and I was interested to find out who was under the mask. As were a lot of the TNA roster, firstly we saw Bully Ray talk to TJ Perkins backstage in a nice touch with Ray being paranoid it was something to do with the Main Event Mafia. Hulk Hogan questioned the match’s referee about who might be under the mask, with the referee knowing nothing. Bully Ray flanked by Mr. Anderson and DOC accussed Chavo Guerrero, Robbie E and Jessie Godderz of being Suicide in the locker room. The Main Event Mafia said they were interested to see who would reveal themselves as Suicide, teasing they might be the new member of the group. These segments really helped to build the importance of the reveal later on in the show and showing the concern from both Bully Ray and Hulk Hogan was another clever move, as it played with the lines between face and heel, showing they can have common goals. In the final segment of the show, Hulk Hogan came to the ring to call out whoever was under the Suicide costume, and if he didn’t reveal himself he would be stripped off the championship. 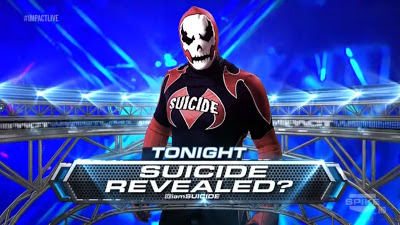 Suicide came to the ring but refused to remove his mask. It was then that Bully Ray entered on his own, siding with Hogan and asking Suicide to reveal himself. It was definitely a nice twist having Hogan and Ray after the same thing and their concern really built up who was under the mask as a threat to the World Heavyweight Championship. 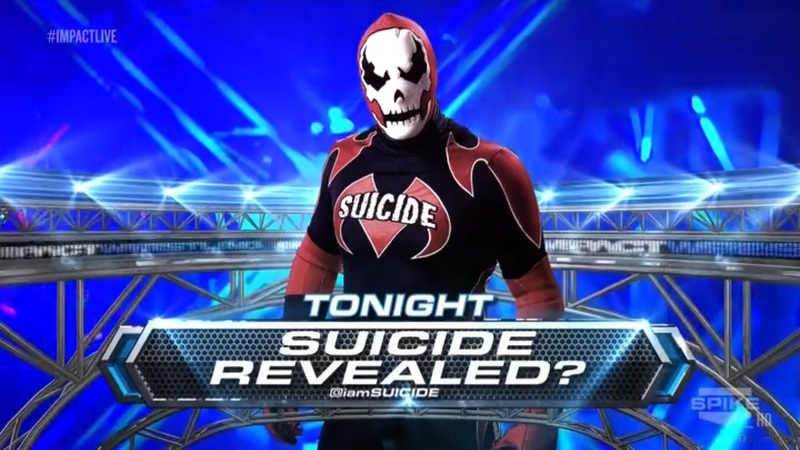 Suicide began to talk but with a vocoder distorting his voice, he cut a strange promo that wouldn’t have worked under any other circumstances but here it allowed the tension to build up to the reveal. The voice distortion slowly faded away, with Suicide revealing he had beaten Bully once before, he removed his mask to reveal…Austin Aries! Aries said he’s be cashing in the belt for another shot at Bully Ray at Destination X. I enjoyed the reveal and having Aries the X-Division Championship again is certainly an intriguing prospect. One thing I’d wonder here though, is that with Aries in the Bound For Glory Series, what happens if he wins the World Heavyweight Championship? Impact Wrestling kicked off this week with Main Event Mafia leader Sting, bringing out newest Main Event Mafia member Kurt Angle. Kurt cut a good promo talking about how the old Main Event Mafia worked, as well as putting Aces and Eights over well as a destructive group and a threat to the new Main Event Mafia. It was also revealed that a new member of the group would be revealed tonight. I enjoyed this as an opening to the show, it set up the storyline well and gave the viewer a reason to keep watching the rest of the show. Sting and Angle were shown entering a room labelled “Club Room” later on in the show, with Sting saying they would be better off this time round. They were later seen watching Bobby Roode as he made his way to the entrance ramp, teasing that Roode had joined the group. These segments were fairly short and felt a bit like TNA filling time, rather than a build up towards the reveal later on. Personally, I feel it would have been more satisfying not to see The Main Event Mafia after the opening of the show, building up the suspense on who they were going to reveal. The reveal would take place during Samoa Joe’s Bound For Glory Series match with Mr. Anderson. It was very different contest to the one we saw between Joe and AJ Styles on the previous weeks broadcast, being much more of a brawl than a technical master class. For me, that’s what makes Joe still one of the best in the business at the moment, the ability to wrestle a number of different styles of matches. Anderson seemed restricted by his current attire of jeans and leather jacket, instead of his previous trunks. With Samoa Joe taking control Aces and Eight’s DOC and Knux came out to attempt a distraction, only for The Main Event Mafia to come storming down the entrance ramp to level the playing field. The match went a bit longing with Joe blocking a Mic Check from Anderson, before locking in the Rear Naked Choke for the submission victory and 10 points in the Series. It was decent match that told a decent story and having it last a little long after the interference certainly helped both guys looking strong. After the match, Angle and Sting came into the ring and hugged Joe before raising his hand. It was confirmed later on in the show that Samoa Joe was the newest member of the Main Event Mafia, in a backstage segment saw Joe handed his new suit. It was another logical move to add Joe to the Main Event Mafia as the only other member of the original group to still under contract with TNA and it felt more effective than the Angle reveal as it didn’t finish the show, therefore no big surprise twist was particularly expected. With the three guys now in place, it will be interesting to see who will be added to the group as we continue towards Bound For Glory. 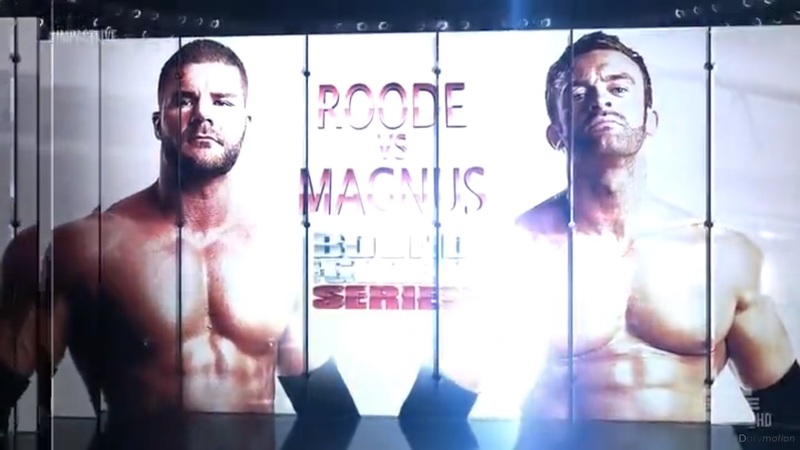 The other Bound For Glory Series match of the night, pitted Magnus against Bobby Roode. It was decent wrestling contest with some nice amateur style work to kick of the contest. Roode went on to take control of the match, including a nice slingshot whilst Magnus was caught up in the ropes. From here the match stuck to fairly basic pattern, with Magnus making a comeback after catching Roode. There were then near falls following signature moves from each man, before Magnus hit the Mag Daddy Driver for the victory. The end was a slight anti-climax, with Magnus looking awkward in getting out of a Fisherman’s Suplex attempt from Roode to hit the MDD. The win for Magnus keeps him top of the Bound For Glory Series with two wins and seventeen points. I can’t see Magnus staying at the top of the series, as he has no real logical storyline to go into with current World Heavyweight Champion Bully Ray. A sustained run near the top of the series however could be very beneficial for Magnus in terms of transitioning him into a main event spot that he could be capable of. Roode hasn’t won in the Series yet, I expect this could be a running theme, possibly with a face turn in the cards for Roode as he looks to pick up a win. Mickie James finally defended her Knockout’s Championship against Velvet Sky. James dominated most of the contest, working over Velvet’s previously injured knee, with Velvet selling well throughout. Velvet had a few comeback attempts and got a few near falls with roll ups. Mickie James eventually picked up the victory to retain the championship with a cross legged version of an STF. It was a decent match between the two, but with the storyline going on for so long and the bitterness between the two, it felt a little anti-climactic, it would have been nicer for the match to go a little longer and feature a few more spots to build on how this former friendship had soured. They did a weird angle at the end with Velvet breaking down and crying, which personally didn’t work for me, it didn’t really make me sympathise with Velvet and made her look a little whiny if anything. World Tag Team Champions James Storm and Gunner came out to put over themselves as a duo, in what was a solid promo from Storm, although it would have been nice to hear what Gunner had to say. They were interrupted by Robbie E and Jessie Godderz accompanied by Tara. It looks like Robbie & Jessie are going to be a team going forward. The rest of the segments, focused around the teams name, The Bro Mans, with Storm winding the duo up by saying it sounded like Bromance as well as insulting Tara. It was wasn’t exactly some of Storm’s best work but is was passable at least. Gunner eventually took out Godderz with Robbie E backing away and pulling out his partner. Storm finished with his catchphrase. Whilst the TNA tag team division is looking thin at the moment, burying a new team like this seemed like a poor move by TNA, although The Bro Mans aren’t realistically going to challenge Storm and Gunner, a victory over them now is going to mean very little to any other new team. The Gutcheck returned this week with Adam Ohriner, known to many as The Big O from Zack Ryder’s Z True Long Island Story, facing off against Ryan Lowe, who has a rockstar gimmick. Lowe came to the ring playing an electric guitar, which was an impressive entrance for a Gutcheck competitor and he clearly has a talent on the guitar. The match wasn’t anything special, with both men struggling to find any connection with the other. The ending was strange with Ohriner winning with a powerslam, and didn’t felt like it had been though through very well. Personally, I wouldn’t sign either man to the company, Ohriner has little to offer bar being Zack Ryder’s friend, whilst Lowe’s gimmick is far too close to Rockstar Spud, so unless they place him in a tag team with Spud I can’t see much for him. What have we learnt from this week's Impact Wrestling? 1. TNA is capable of pulling off a great show long storyline. 2. The three guys we expected to be in the Main Event Mafia are in the Main Event Mafia. 3. The Gutcheck Competition is one of those things that sounds good on paper, but has yet to be excuted correctly.